SKU: SKU22643 Categories: ALL PAINTBALL GUNS, Kingman Spyder Brands: Kingman Spyder. The Hammer pump-action paintball marker was first released by Kingman over 20 years ago as one of our flagship products. With great anticipation we introduce the 2013 Hammer 7 pump-action paintball marker with cool new features that didn’t exist two decades ago. 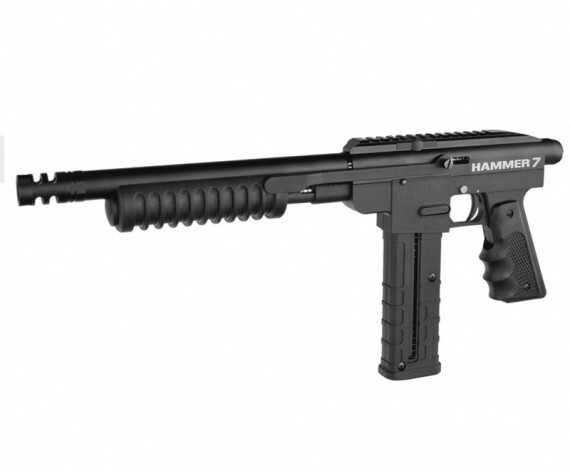 The Hammer 7 mil-sim shotgun style marker comes stock with a 9-round magazine capable of shooting .68 caliber paintballs and the new First Strike paintball from Tiberius Arms. The First Strike paintball offers 2x more range and 25x more accuracy. The included clamping center feed neck can be attached to use a traditional hopper feed system.